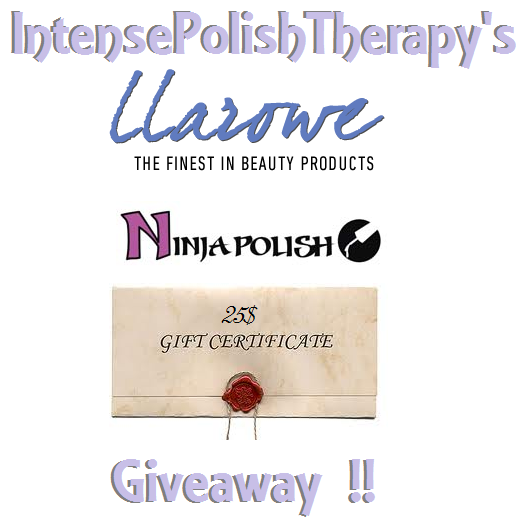 Intense Polish Therapy: GIFT CERTIFICATE GIVEAWAY !! Hello !! Welcome, today I would like to share an idea I had I would really like to build a bigger audience so I am hosting a giveaway. To enter to win the Llarowe gift card follow my blog & please comment down below letting me know which polish on Llarowe's website you'll be using the gift certificate to cross of your lemmings list..
To win the Ninja polish gift card go on facebook, 'Like' my facebook page & comment on the giveaway post letting me know which polish on Ninja Polish's website you'll be using the gift certificate to cross of your lemmings list. So tweet, share or make a post. It's up to you how you spread the word. Would buy me in LLarowe , Ozotic 515 and Jade hologram. It is impossible for me to choose just one! I would probably go for more Dollish and Jindie! thanks for the chance! I really want one of the Jade polishes, so at the very least one of those! With the new shipping rules in the UK, any A England polish is my new lemming! Thanks for the chance! AHHH! I don;t know, it will literally take me hours to decide BUT since I'm forced to choose now I'll say Lush Lacquer Mr. Bubble if it's in stock or Candeo Colors Jelly Bean! From Llarowe the first polishes I would get are: Emily de Molly - The Fifth Element and When Planets Collide and/or Femme Fatale - Winter Hyacinth. Great giveaway! I would probably get CrowsToes Cheshire and Maxxed Out- or Absolum if it was in stock! I would probably get an Enchanted or Femme Fatale from Llarowe! From Ninja Polish, maybe my first floam! 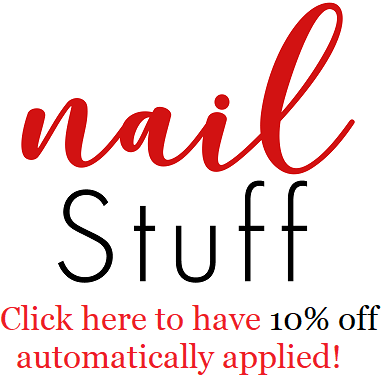 Ninja polish here.....who told you that we don't ship internationally? You have been misinformed. We do ship internationally and have never not shipped internationally. Please feel free to contact me at NinjaPolish@gmail.com for more information. Thank you for the amazing giveaway! I really don't know what I would choose exactly from Llarowe, but it would probably be some holos. On Llarowe I would get indies! Anything I like LOL. I need more indies, I was late to the indie party :) Thank you!! ON Llarowe I would buy Jindie polishes. Thank you for the giveaway!!! I would love to have Floam from Ninja Polish and Picture Polish Cosmos from Llarowe. I Love your posts the dusties! !